Fender's classic combo amp is back! 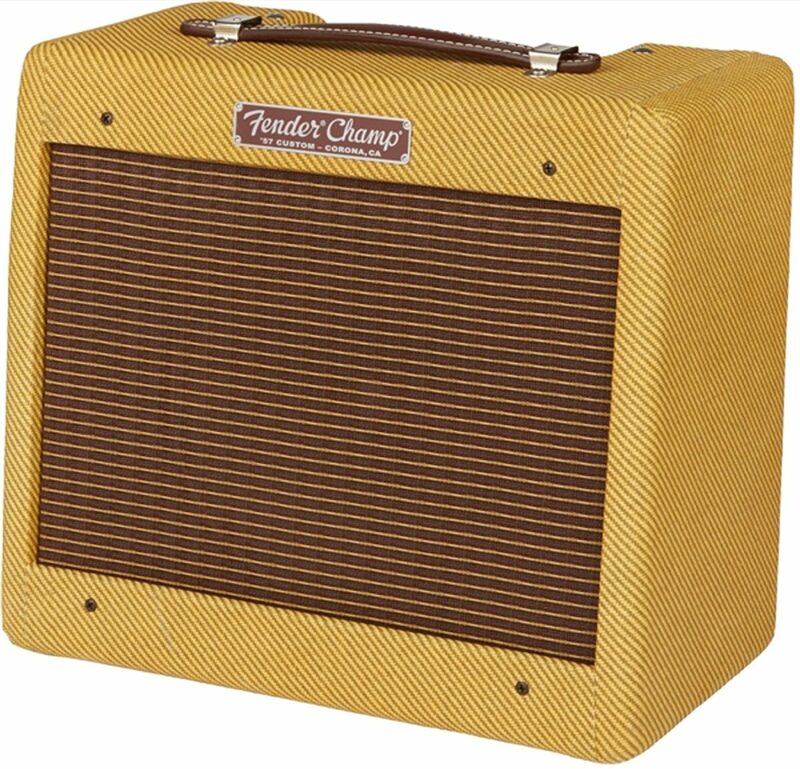 In its latest incarnation, the Fender '57 Custom Champ guitar combo amplifier is a tribute to the vintage Fender Champion 800 first released in 1948 -- a low-wattage tube amplifier with a simple yet tonally beautiful amplification circuit. 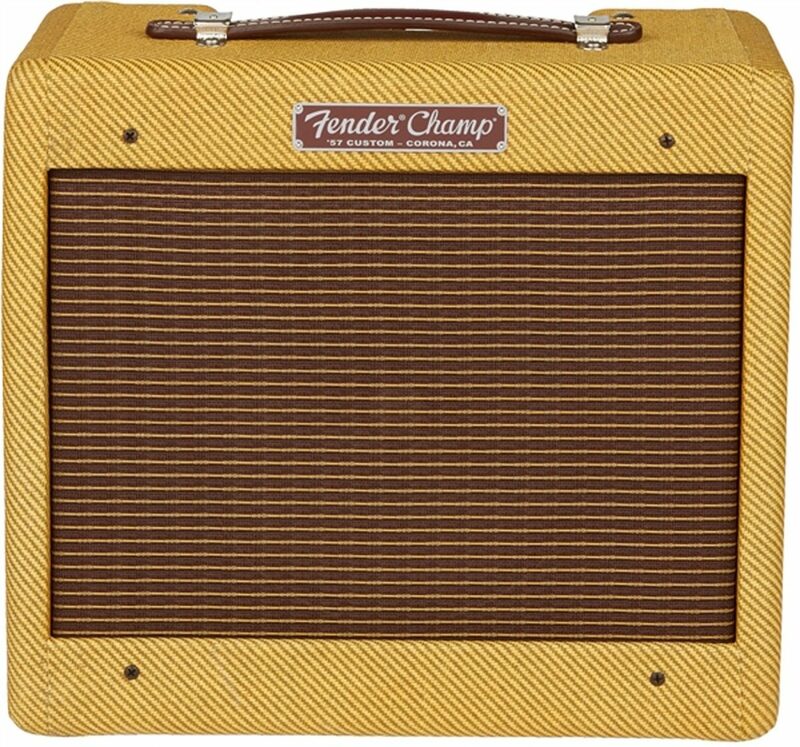 The Fender '57 Champ amp of the late 1950s is well known as the small-but-mighty tone machine that belongs in every serious guitarist's collection. 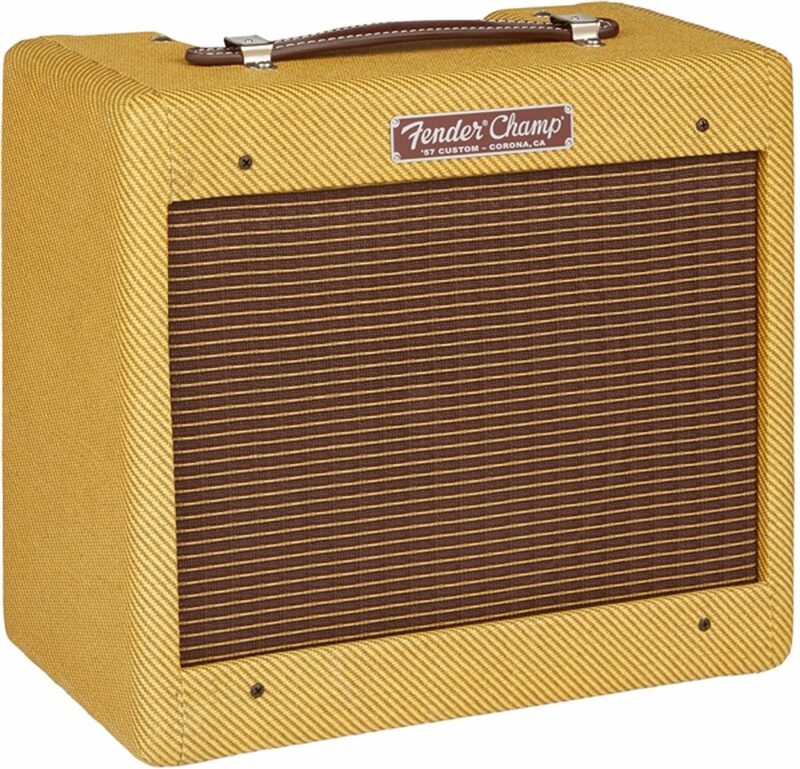 The release of the '57 Champ adds this iconic, one-of-a-kind product to Fender's '57 Tweed Series. Don't be fooled by the wattage -- at just 5 watts of power, the '57 Custom Champ and its predecessors represent Fender's lowest-wattage tube amp ever, but it's that low wattage that makes this amp ideal for studio use and practice sessions. At 5 watts, the '57 Custom Champ is easy to overdrive in a small space without cranking the amp up to deafening volumes, allowing it to deliver a classic rock crunch even in the smallest of spaces. But it's not just about overdrive, lower volumes is where the '57 Custom Champ really shines, with silky smooth tones and vintage twang you'd expect to get only from a real vintage amplifier. 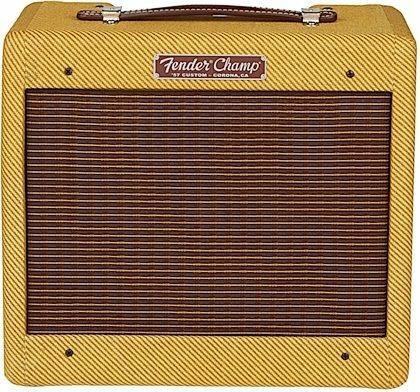 The tweed Champ is a terrific practice amp, and has been a prized possession of countless pro players for its great sounding, low-output, easy-to-record capabilities. 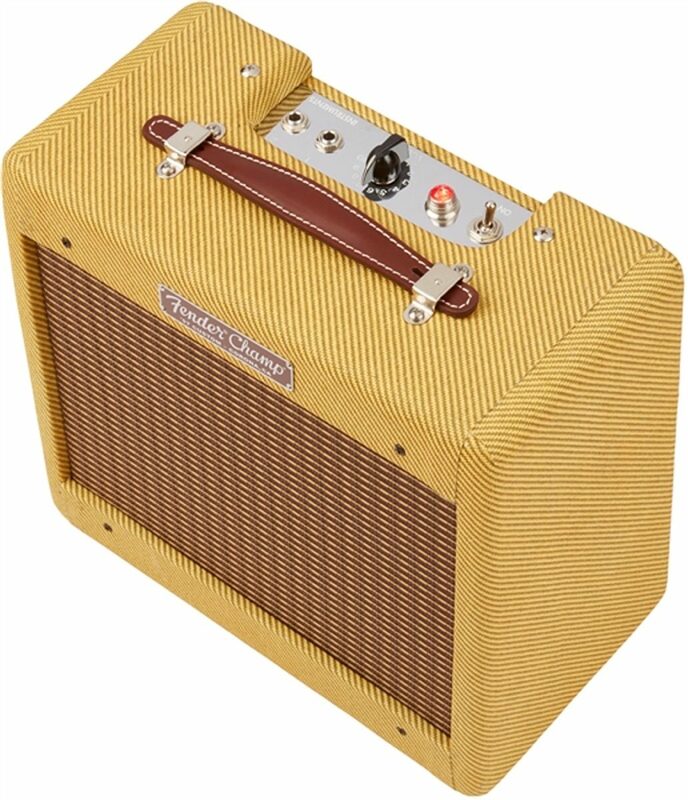 It's well documented that this model has been used on recordings by Johnny Cash, Keith Richards and Eric Clapton (it's the "Layla" amp). And with its rich tone and touch-sensitive response, the Champ is great for making cool new music today. The '57 Custom Champ is a tribute to classic rock's favorite studio amp -- the amp used in literally hundreds, if not thousands of classic guitar recordings -- and this reissue has been faithfully designed with classic features in mind. 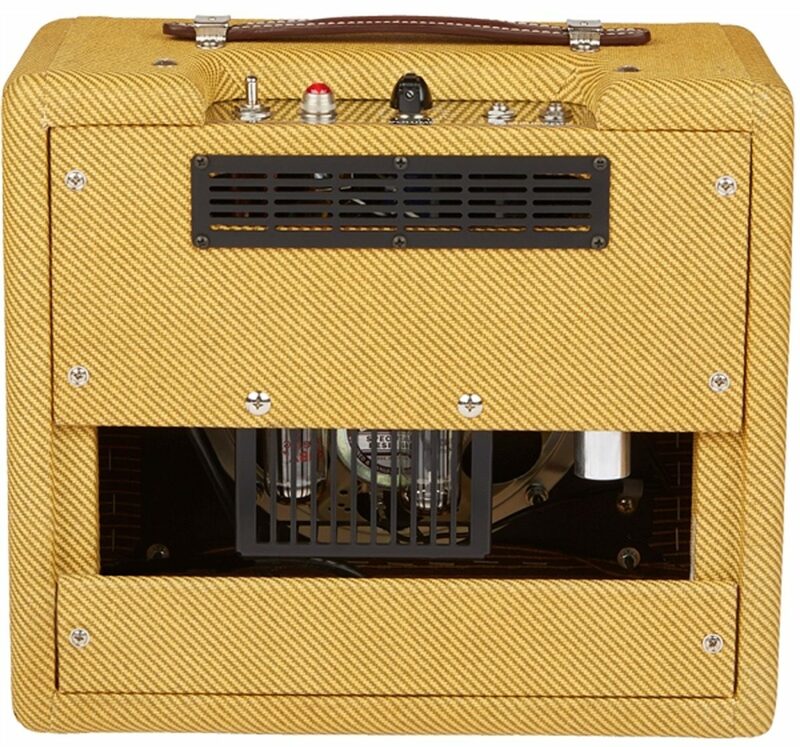 Sporting a narrow panel cabinet design with tweed finish and Fender Bassman-style grille cloth, the amp looks like a real 1950s amplifier. And equipped with a simple silverface control strip featuring just a single volume control and no tone controls, all of which are driven by a specially selected tube amp and hand-wound, period-accurate amplifier circuit, the Fender '57 Custom Champ doesn't only look like an amp from the 1950s -- it sounds like one too. This faithful hand-wired recreation of the 1957 Champ amp is not just for collectors or retro-minded guitarists. Any player seeking the ultimate in low-powered, top-quality tube performance need look no further! 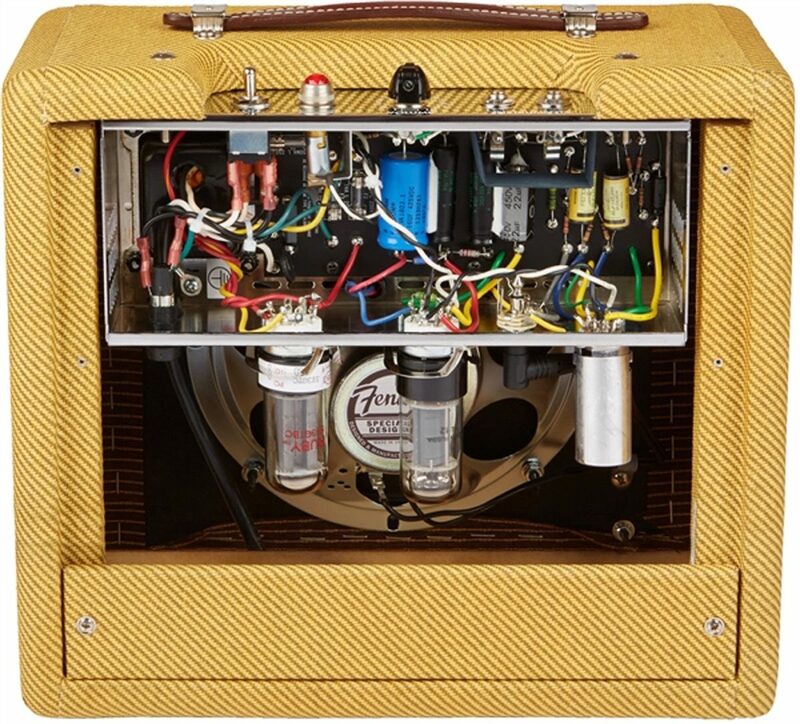 The Fender 5F1 circuit used in the '57 Custom Champ has become legendary for its heightened dynamic response and sweet sounding tube overdrive when pushed. A 12AY7 preamp tube matched to a classic 6V6 power amp tube generates this in-demand overdrive. When the volume is cranked, this little wonder sings with the natural compression and rich even-order harmonics of a power tube working at peak output in Class A topology. The 8" 4-ohm Weber Special Design alnico speaker stays true to the classic Champ sound, compressing to create fat tone at higher levels while more than ably reproducing the raunchy tones found at the top of the amp's volume knob. The hand-wired circuit includes newly sourced yellow coupling capacitors chosen for their authentically vintage Fender tone--sparkly cleans and creamy overdrive with smooth top end and round mids. 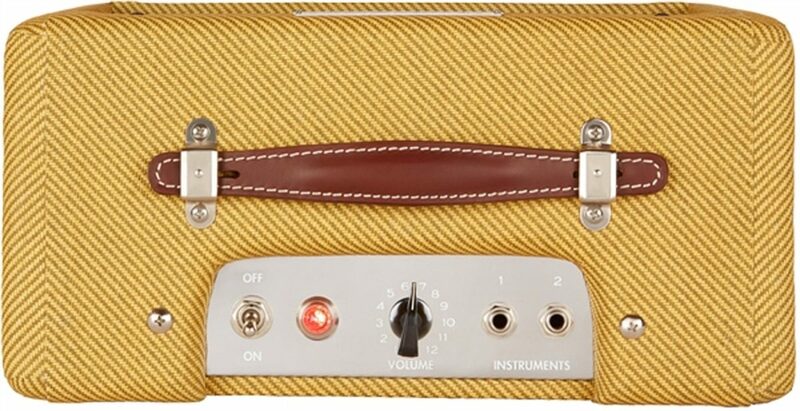 Of course this amp sounds great; it also retains classic Champ visual appeal--lacquered tweed, chickenhead knob, leather handle and 1/4" inputs for low or high output instruments are all here. In the studio, the 5-watt design means you'll be able to explore the full range of available tones without overloading sensitive microphones (or your ears). Updated components, hand-wired craftsmanship and a classic circuit design all combine to create the '57 Custom Champ, a style-spanning performer. 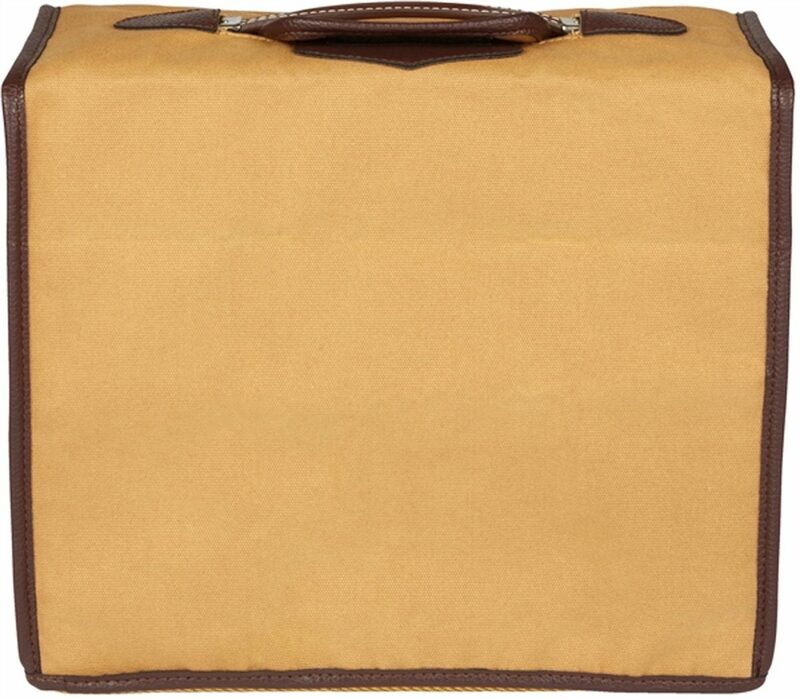 Includes a protective cover. Overall: I've been playing for over twenty years have long wanted a Fender tweed amplifier. However, I almost solely play at home (in an apartment). Of course, most people buy tweed Champs so they can crank them up and overdrive them and there are tons of videos on YouTube of people doing that. If you have your own house and do recording, then it's perfect for that. That said, I play mostly classic country, rockabilly, and classic R&B, so I was going to use it more for the cleans. All of this is to say that I suspect I am not the typical purchaser of this amp. What I have found after playing the amp for a week is that it was certainly worth the cost, even just for playing mostly clean and at bedroom levels. We're conditioned to think of the blackface as the prototypical Fender clean sound, but the clean tweed sound is fantastic in its own right (thicker, less scooped). I've been playing it with my Fender 50s Road Worn Telecaster and it is amazing. Multiple times in the last week that I've owned the amp, I've found myself just smiling while playing because of the sound. In terms of volume, I play it mostly between 3-5 (depending on the guitar) and it's perfectly fine for bedroom levels but with the 12AT7 it doesn't start breaking up naturally until a volume that's at least too loud for my situation. Make no mistake, this amp puts out a very loud 5-watts. And don't be confused by reviews online of the earlier 2009 model which had a 12AX7 and broke up much earlier than the newer 57 Custom model (though you can of course do a tube swap if that's what you want). In fact, I have loose plans of swapping out the stock tubes for NOS at some point in the near future, though I'm not sure if I'll try the 12AX7 or not. As mentioned, I've paired this with a recently purchased Fender 50s Road Worn Telecaster and it is a fantastic combination. I've also played my Epiphone Sheraton II with humbuckers through it, which is great, but an amp like this seems to call out to Teles and Strats (or even something with P-90s). And of course purchasing it from zZounds was easy and very fast (guitar and amp both came in two days). Overall: Stop fooling around with all the knobs and JUST PLAY. I've had many amps. The Champ is 2nd to none. Just warm it up, turn it to 12 and then play guitar using the knobs on your guitar. This amp sounds like it has reverb, delay and tremolo but it doesn't. It's simply alive. The combination of everything combined in this little package make for such terrific amp. The build quality is superb and it's made to last a lifetime. It is a bit RAW when new, but as it breaks in, it gets sweeter and warmer.